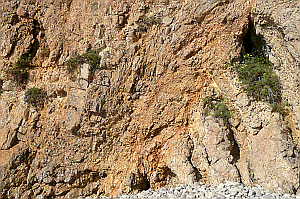 Faulting and folding in two accessible and adjacent sections of Cretaceous limestone cliffs at Sitges provide ideal sites for geology teaching in the field and subsequent field assessment. Draw annotated sketches (to scale) of the area to show the main features. Measure and sketch the fault lines, bedding and mineral veining patterns. Measure the thickness of a number of different beds. Identify and describe each of the different rock types using measurements, detailed descriptions and sketches. Measure the angle of the fault. Estimate the direction and amount of throw on the fault. Decide what type of fault you have drawn. Describe any features which are associated with the faulting, making detailed sketches if appropriate. Find a mineral vein and describe how it relates to the fault. Measure the direction of joints on both the limb and crest of the fold using a method that will give a data set of accurate results to plot on a rose diagram. Describe how you could improve your methods for collecting joint data and how they could be changed with different equipment. Comment on the differences between your data and group data. Explain the relationship of the joints to the fold. Decide where a fold could be and estimate the dip of the limbs where possible. Make a sketch of the fold structure shown in the cliff. Measure and mark your dips on the sketch. Find and describe mineral veins and slickensides and state how they relate to the joints. Describe any field hazards and the safety procedures followed.